21 travel tips from experienced business travelers is a great way to learn now to travel in comfort. Living on the road can be tough, but business travelers often have travelling down to a science. 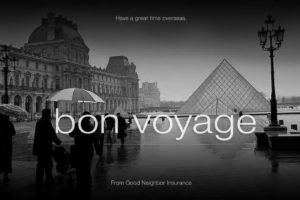 Good Neighbor Insurance fully understands what it is like to travel domestically and internationally. We would have added one additional travel tip to make it 22. Pack 2 chargers for your tablet (ours is the iPad) and cell phones. This allows more peace of mind, especially if you are like me and enjoy movies on the go. Talking about peace of mind, do make sure you have your overseas travel insurance cover with you. I am an avid scuba dive and scuba dive throughout this wonderful world of ours. We know that no matter where we are something may go wrong medically with my family. Since our doctors our way over the other side of the world, we make sure we have the best travel insurance money can buy. Why? Because it provides us with peace of mind for sure. Secondly, I rather hand my travel insurance card then my Visa or Mastercard to the hospital. Our family uses the GeoBlue Voyager Choice located here at https://www.gninsurance.com/geoblue-voyager-choice-essential-single-trip-travel-insurance/. One of the great benefits of an international travel insurance policy is the evacuation cover. We never expect to use this benefit for sure. But we sure are happy to know that, if needed, we will be medically flown to the nearest and best hospital to take care of any medical condition that may accidently come up. Did you know an average an international medical evacuation flight, one way, can cost between 20,000USD to 40,000USD. Wow! That is a pretty nice car we could give our son for his graduation present from high school. Or a great vacation to take our family to celebrate our daughter’s college graduation. Yes, our family is that special. Our kids love to celebrate their “high five” moments in life with their Dad and Mom. It is a blessing to have super kids, isn’t it? Yes, travel insurance is just another instrument to keep our family from the poor house. Who enjoys spending money on insurance? Not me for sure! But I rather spend the small amount per day, about the price of my hot coffee I get at my local java shop, on peace of mind knowing my family is taken care of. Isn’t that what a husband and dad is supposed to do? Take care of his family first? For sure! That reminds me. I have to make sure our passports are on my desk with our tickets for our long awaited two week trip to Bali, Indonesia that we will be heading out in two days. And yes! I already purchased my GeoBlue Voyager Choice travel insurance policy for my family for this trip! You thought I forgot. Right? No way! This old timer still has his a few marbles still upstairs. Not sure which travel insurance is best for you and your family? Connect with us at https://www.gninsurance.com/. Our Good Neighbor Insurance licensed trained insurance team members are here to serve you, our guests! You may call us on our toll free number, 866-636-9100 or our Arizona phone numbers of 480-633-9500 or 480-813-9100. You may email us at info@gninsurance.com. Safe Travels from your GNI team in Arizona, USA! This article does a great job in reminding even the most astute traveler some key points to make traveling a whole lot easier and especially more comfortable. From scoring upgrades to the best way to pack a suitcase, anything that can make the hassle of jet-setting a little easier can be a lifesaver. We reached out to several frequent flyers to find out their favorite travel strategies.